Habitat loss and fragmentation is the biggest threat to the continuing survival of Asian elephants. The main cause of the loss of the natural forest is pressure from human population growth. 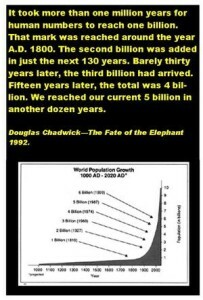 The extraordinary figures quoted from Douglas Chadwick (opposite) only tell what has happened in the past. The future is even more shocking – if the number of people continue to grow at its current rate, by 2054 the world population will have doubled to a mind boggling 12 billion humans! Add to this the fact that it is estimated that 20% of the world’s total population live in or near the range of Asia’s elephants and you have some idea of the colossal pressure that human population growth has placed and is placing on elephant habitat. People need somewhere to live and more importantly, they need land on which to grow food. In addition to food crops, forests are being logged for their timber or cleared to make space for cash crop plantations such as rubber, tea and palm oil. As the human population has inexorably risen, the former forest wild lands in which elephants live have been disappearing. Elephants and humans are increasingly fighting for space; human elephant conflict is on the rise and it is a battle that the elephant is losing. As elephant habitat diminishes, the elephants are pushed into increasingly smaller areas. This increases the population density to beyond sustainable levels and food grows short. Evidence suggests that a shortage of fodder has a negative impact on rates of reproduction so normal birthrates begin to decrease. Another serious consequence of the shortage of wild foods is a corresponding increase of crop raiding and incidents of human-elephant conflict. The clearance of land has not only resulted in large net losses of territory, but also the fragmentation of habitat. This fragmentation breaks up wild populations into herds and groups that are often too small to be viable. The breaking up of elephant populations also leads to inbreeding and the loss of the necessary genetic diversity to sustain population viability over the long term.